"Light of the World" is less a mystery than a treatise on the nature of good and evil, especially evil. James Lee Burke's main characters, Dave, Clete, Alafair, and Gretchen, are one voice mulling, raging, and exclaiming about, and inveighing against the evil in their lives that either haunts them or stares at them slit-eyed in person, while smelling of sulphur and excrement. Dave Robicheaux has been James Lee Burke's window into a world of hard times and hard crimes since 1987. Dave has been the voice crying for justice in the bayou wilderness. Although Dave carries a police detective's badge, his sense of justice is his own and not borrowed from any rule book. His best friend and former police partner, Clete Purcell, was tossed out of the New Orleans PD a long time ago. As a private investigator, he has tiptoed with elephant feet between working for legitimate bosses and mobsters. Burke has rounded up all of these characters, along with Molly, Dave's wife, and taken off for Montana for some R&R. But this is not a book in which we read about Dave and Clete fishing (although they do some of that) or enjoying a leisurely chinwag or serenely gazing off at the natural beauty surrounding them (although they do some of that, too). If it's a book about evil and its earthly manifestations, then there's gonna be less R&R and more action, bloodletting, and general nastiness. Right off the bat, someone shoots an arrow at Alafair while she's jogging. Then Gretchen discovers the sober truth about how some law officers have their own version of the law. Then a young girl is murdered. Then a slob of a guy, whom no one will mourn, is murdered. That happens fairly early on. Then leisurely paced throughout the 560 page book there are more bodies and a lot more brutality. "Light of the World" is sort of epic in that way. Maybe it should have been named "Walk Towards the Light." Wyatt Dixon, resurrected from "In the Moon of Red Ponies," appears as a born-again, speaking-in-tongues ex-con. Does he testify for the Lord in Aramaic? "Some people say it's Syriac. Some says Aramaic and Syriac is the same thing," he says matter of factly. Is he really reformed, or is the rodeo clown from hell still a couple of gallons short of a full tank and sowing terror along with the good word? Asa Surrette was a seriously sadistic serial killer. His body count was probably way more than his confession would indicate. Awhile back, with the idea of a book in mind, Alafair asked to interview him. Although a book never materialized, Alafair wrote several articles on Asa, none of them flattering. Although she thought that she would never actually be in danger from him, incarcerated as he was in Nebraska and especially after he died when the police van in which he was traveling burned with all hands on board, Alafair (and Dave) fairly rapidly comes to the conclusion that Asa is the one who shot the arrow at her and it is he who is now stalking her. "Light" is also a centerpiece for the suffering of women. Although Clete and Dave thrust their chests out at perceived threats, and bluster at the authorities and rich-people-who-think-they-can-do-anything, they often take second chair to Alafair and Gretchen, who can bluster for themselves quite well, thank you. A couple of other female characters are central to the plot as well and their stories add, somewhat tediously, to the length of the book. This is Burke talking about the awful deeds that human beings can do. They don't even have to rationalize them either. This is about the mysteries of life and death, love and hate, and God. Unfortunately for the good (but flawed, massively flawed) guys, there are complicated and conflicting clues. In Burke's world, people must gamely put one foot in front of the other, cling to what happiness and comfort they can find, try to be better people for the love of others, and prepare for the next assault. Dave sums up what he's learned about life: "At the bottom of the ninth, you count up the people you love, both friends and family, and you add their names to the fine places you've been and the good things you've done, and you have it." Burke's writing is ardent in his descriptions, metaphorical in its reach, intense in its crimes. I could have done without a scene or two, a character or two -- I definitely would have left Felicity Younger (wife and daughter-in-law of filthy rich, and just plain filthy, oilmen) and Bertha Phelps (appearing initially as a particularly inept reporter) at the pop stand. Burke has been edging up in the page count over the last few books. It seems his fictional world these days contains too much to fit anymore in less than 400 pages. He has too much to say about how pitiful our standard response is to the evil out there, how we must deal with our morality and mortality, how there's more to this world than is contained in this world. Actually, never mind "Walk Towards the Light." Based on the Odyssean nature of the quests of all the characters -- while floating on a "wine-dark sea" and hearing their individual sirens' calls -- the book should have been called "The Odyssey Redux." Even though "Flashfire" was written fairly recently in 2000, this is a classic crime novel. Clean, clever, enigmatic when it should be, plain-talking otherwise. Richard Stark, the alter ego of mystery master Donald Westlake, created one cool cat when he made Parker -- no first name given or needed. Parker is a thief with a devious mind, a code of ethics, and ice running through 90% of his veins. If you've read any of Westlake's funny Dortmunder books, you will be surprised at the no-nonsense Parker books. There is some humor, but it is of the ironic variety. I love caper books. If they are done well, a reader can savor the finesse with which the crooks pull off their heist. "Flashfire" begins with a teaser heist. Then comes the double-cross. Of course, the re-cross has to follow, in this case with a (darkly) humorous twist. Lastly, there is the grand heist and the final accounting, and that's not referring to just the loot. Parker runs a small heist in Nebraska with a group men with whom he has never worked. They ask him to participate in a larger theft in Florida. When he refuses, the group takes most of Parker's share of the heist money to finance their big job, definitely against his will. Just borrowing it, the group insists. And that buys the group a whole lot of trouble. Parker has to finance his revenge, so we see him pull off a few solo jobs to make his nut. He controls as much as he can, but in the end, he has to rely on others in various ways. One of them, a real estate agent in Miami, Leslie Mackenzie, provides unintentional impediments to his scheme. Parker can juke with the best of them after a few spanners are tossed into the works and he has to come up with on-the-spot resolutions. So much cleverness packed into 278 pages! Stark takes the time to flesh out a few of his side characters -- Leslie, most notably. Also, a portrait of an aging Florida society dame, while not necessary to the plot, adds luster to the book. Stark weaves quiet pathos and desperation into his story. It's those tiny lights that illuminate his book. Wait, what happened? There were so many dangling plot threads at the end that it's difficult to assess this book adequately. For the most part, I thought the story moved along well. The protagonist was unusual, another plus factor. Ash Rashid is a detective for the Indianapolis prosecutor's office. He's going to law school while holding a full-time job. His wife is a nurse and his daughter is four years old. They are all practicing Muslims, if you don't count the fact that Rashid is an alcoholic. This setup caught my interest right from the start and kept me going. There are stories about police corruption and the Russian mafia. And vampires. The Abbey is a wannabe fangster hangout. Rashid's teenage niece has been poisoned, and he wants to find out why the good girl he knew was hanging out at a vampire bar. Soon Rashid is suspended from duty, but that doesn't stop him from investigating when more teenage deaths occur. The final issues stray far from the initial case and there's a bang, bang, shoot-'em-up movie ending. So these questions won't make sense to you unless you read the book, but when it ended I did a lot of head scratching. Does Rashid have a mysterious disease or not? What does the corrupt police officer have to do with the mad scientist? It seemed from the storyline that the detective was actually aligned with the scientist's competition. Why does the scientist need the vampire crowd? "People will do anything for you if you give them something to believe in," the scientist says. What exactly was the scientist going to have these American vampires do, given the stated desire to affect a different part of the world? Are the parents of Rashid's niece satisfied that he found out how she died? We don't know because we never see them again! Why, why, why, why, why? First of all, I have to apologize to Linwood Barclay. I decided to try to read a book on my iPhone, and his was the test book I downloaded. That was in September 2012. I've slowly made my way through "Trust Your Eyes," in odd moments, page by tiny iPhone page, all 1,534 of them. Fortunately, I couldn't have chosen a better book. This book is clearly written, has engaging characters, with a straightforward plot. A+ to Linwood Barclay in a category probably no one else ever uses to judge a book: ability to read in snippets over a ten-month period. Ray Kilbride's father has died. He returns home to tie up loose ends and decide what to do with his autistic brother, Thomas. Although Thomas is an adult, he has lived with his father all his life. It is time for Ray to learn who his brother is and how to take care of him. Thomas has a fixation with "Whirl360," a program like Google maps, in which you can see real pictures of homes and streets. He has been memorizing the layouts of many big cities around the world. He travels street by street on his computer and gets a good look at everything. He thinks that the CIA and former president Bill Clinton need him in case the power goes out and digital geographic aids no longer work. Morris Sawchuck is running for governor. His wife, Bridget, is a wild card. She has been having an affair with Allison Fitch, a young woman who indeed stoops to blackmail. Howard Talliman, Sawchuck's closest advisor, has decided to take matters into his own hands. As a result, one night Thomas sees a picture on Whirl360 that looks like a young woman being strangled in the window of an apartment in New York City. It is Allison Fitch's apartment. To humor Thomas, Ray goes to that apartment to half-heartedly investigate, and suddenly he and Thomas are on the radar of bad, bad people. Add to the mix queries about what really happened to Ray and Thomas' father and why Ray has an aversion to leaving his house, and you have a pretty good mystery. Julie McGill is a local reporter and Ray's high school classmate. She provides the romantic interest for Ray and a sympathetic presence for Thomas. Thomas Kilbride is the most fascinating character in the book. His disorder, the byplay with his brother, his obsession, and his realness move the book onto a different level. Overall, there are many different mysteries, all of them intriguing. I had to look at the title again and again to make sure I wasn't reading Kafka's "The Castle." Charles McCarry's protagonist in "The Shanghai Factor" doesn't have a name; at least the protagonist in "The Castle" had an initial. In a book that has no action, unless you count colliding bicycles as action, the conclusion has to be that this is not a thriller about spies but an exposition about the psychology of being a double agent or how ambiguous a bureaucracy can be. For brevity's sake let's call our hero N&A (Nameless and Aimless). N&A has an ear for languages and he can geographically place people by their accents. Although he is a laowai, a foreigner and, furthermore, a hairy white beast, he learns to speak Mandarin fluently, apparently with a Shanghai accent. He spends several years in Shanghai perfecting his Mandarin, while operating undercover for the CIA, although it's never actually called that. As a matter of fact, the agency N&A works for is never named. N&A has signed on as an independent contractor with the counterintelligence department, under the care of Luther Burbank. McCarry takes a precious paragraph to explain that the character is no relation to the famous botanist, nor is there anything else remarkable about the name. So why name the character that at all? As a matter of fact, why does McCarry do a number of the things that he does? For instance, Burbank's office is a windowless, cavernous office with safes filled with secrets stacked one upon the other around his room. N&A can only access his "office," a tiny windowless room, through a door in Burbank's office. Also, "The Gang of Thirteen" is an unremarkable group of decision makers who appear abruptly to sanctify N&A's inclusion in the agency, then disappear just as abruptly from the pages. This is an odd, odd, odd book. The most curious are the "girlfriends" N&A finds. He assumes, and we do as well, that they are agents, but he has a good old time with them, nevertheless. His mission is at all times unclear, his status uncertain, and his agency help unhelpful. For instance, his original mission is to create a fake network of Chinese assets. Burbank suggests using "the usual methods…befriend, befuddle, betray." If you don't hanker after a Ludlum-type adventure or even a spy novel along the lines of what McCarry has previously written -- he started the Paul Christopher series in 1973 with "The Miernik Dossier"" -- then you have an interesting opportunity to take a journey with a budding young spy as he makes his way through a Kafka-esque environment. Will he fail the apparatus or will the apparatus fail him? Does it ultimately matter? This is the third DS Alex Morrow book, after "Still Midnight" and "The End of the Wasp Season." It really doesn't pay to start with this book, because there's very little in the way of a refresher course for who the characters are. If you don't need to know more than a cursory amount about Alexandra Morrow, then there's no reason not to read this as a standalone. You'll miss what drives Morrow, though. Denise Mina weaves together three separate stories set in Glasgow, Scotland. Although we occasionally glimpse one from within another, it isn't until the "oh-no-she-di'int" conclusion that we see what they all have in common. The main story concerns a post office robbery and murder of one of the customers who, oddly, seemed to know the masked gunman. The second story is about two bottom-tier police officers who decide to take a bribe from a bottom-tier gangster. Lastly, a politician is in trouble because his indiscretions with women/girls other than his wife seem to finally be about to metaphorically tie his shoelaces together to trip him. Because there are three stories, it sometimes becomes hard to keep track of where each story was last left. In one case, a criminal is arrested, his real name only mentioned once about 100 pages before, and I had no idea who he was when he showed up again in the story. It's a great fooled-you ending, however, making up for any disjointedness prior to that. Mina has always succeeded in providing a gritty look at Glasgow, all its warts glowing and growing in economically and morally depressed circumstances. Although the buildup is at times slow, especially in the politician's story, Mina's storytelling ability is powerful and compelling. Izzy Spellman is a woman who refuses to grow up. She is the owner, by virtue of a hostile takeover, of her family's detective agency. She is the boss of her mother, Olivia, her father, Albert, her sister, Rae, and two non-family members, Demetrius ("D") and Vivien. A brother, David, is an over-qualified househusband. Throw Henry Stone, Izzy's ex-boyfriend, and Granny Spellman into the mix, and you have a soup made from funnybones. Izzy is the narrator of the latest "document" in the Spellman family files. She is 35 years old, lives in the dumpy basement of her brother's house, flees when she thinks she may be asked to babysit Sydney, David and Maggie's 3-1/2-year-old daughter, and puts off dealing with the family finances in a way that would make Scarlett O'Hara proud. Edward Slaytor was Izzy's financial backer in the purchase of the p.i. business. She also runs investigative errands for him, jogs with him (much to her displeasure), and is one of the few people who knows that he is battling early onset Alzheimer's. It's a scattershot of cases that makes up "The Last Word." Edward needs a company vetted before advising its purchase. At the same time someone is trying to discredit Edward or his Alzheimer's has gotten out of hand. Olivia and Albert are reacting to Izzy's takeover with bad grace. Rae is angling to come back to the firm but as something called a "conflict resolution specialist." Vivien is fighting a disreputable moving company that cheated her. Demetrius is being furtive while baking up a storm. The computers are off their rockers. Sydney strongly disapproves of her aunt in an overly mature and imperious way. So funny. So Izzy. And not just funny. In the end, very touching. Could this be the last Spellman installment? One can only wait and see. Okay, now the first rush of freedom from school schedules is over and it really feels like summer. Time to dust off those beach/mountain/cool basement mystery books you stashed away for vacation or put on hold at the library and settle in for a nice long read. But what about your kids or grand kids? Picking out mysteries for kids has many components: age appropriateness, interests of the child (NOT just your favorite childhood book or one you think will “improve” them) and popularity with other kids,(yes, those rewrites of a movie they just saw and, never to be undervalued, comic books, count). The internet and teachers (what did your child like this year?) can give you hints to help you chose some great summer reads and so can your local children’s librarian. But the perfect book alone will not open the magic of summer reading. You love reading, but if your under fifteen year olds are rejecting reading as the glorious adventure you know it to be, take an inner journey to your own beginnings. To go on a trip to the library? To receive a book as a gift? No one drops into this world a born reader, even if it feels that way to some of us. What came before the reading or what came with the reading is the key to creating happy readers. A trip to the library can be something the whole family looks forward to.The long walk or bike trip to the library (gets the physical jitters out), the time spent talking about book choices, stopping for special snacks on the way home (I recommend cherries and apricots in July) or visiting a park with your new bag of books and a big blanket.. Being read to every night reinforces the connections between reading and comfort and according to some research is the best predictor of future reading habits. Help kids love that trip to the library, bookstore, yard sale or thrift store and get ready for years of happy summer reading. 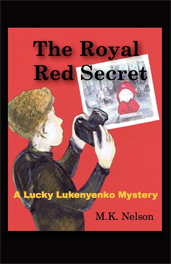 M.K.‘s middle grade mystery novel, The Royal Red Secret, is available from your local bookstore.